Undoubtedly Machu Picchu is fashionable , many characters received our Wonder: among presidents , athletes, renowned singers, and many more who simply marveled at her beauty. We will make a collection of the people. 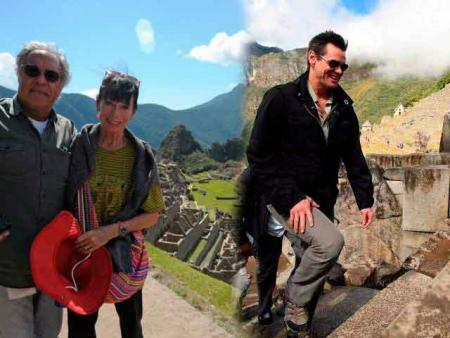 Geraldine Chaplin Charles Chaplin 's daughter surcharge energies in Machu Picchu , not just visit our wonder , there was a great walk along the Sacred Valley and Cusco. Actress Michelle Rodriguez Fast and Furious film, was very impressed with his visit to Cusco and Machu Picchu, who participated in the filming of a documentary about the city in the mysticism of the Incas and their descendants. Can not fail to mention Richard Gere, toured the area on two occasions , toured with satisfaction each enclosure , I admire the temple of the sun, Acllawasi among other sectors. Another of the most memorable visits was that of Jim Carrey during his visit not stop being besieged by people, this fact was recorded in photographs taken by the press and fans. We present a Rock legend Mick Jagger, who together with his son and wife arrived in Cusco , likewise showed great astonishment by the location of the citadel.